Dr. Daniel Amen:	Welcome back. Leeza Gibbons:	Sign me up early. Dr. Daniel Amen:	... let's live it up." What do you think? Leeza Gibbons:	I think the definition of live it up then needs to include okay, what can I do to change the path of what could look like a predestined future? You know, I'm a big one on saying, "I don't want to borrow tomorrow's troubles today," but I certainly don't want to be naïve. And I think for those of us, and there are so many millions of us, who have relatives with Alzheimer's disease that put us at greater risk, we need to recognize that everyone who has a brain is at risk. It is a false sense of security, right, to think that I'm never going to get it. I don't have a family member that has it. So that's one thing is, yes, we are at greater risk, but if you have a brain, then you are at risk for these diseases. Probably while we've even been talking on this podcast, the numbers have changed. But what is it now? Every 58 seconds or something everyone is diagnosed. I mean, someone is diagnosed with a new case. And as we've said before, that many of those new cases are women. I've learned that early intervention ... The sooner you know better, the sooner you can do better, and the sooner you can begin to change the things that are within your ability to alter. Dr. Daniel Amen:	And there are a whole bunch of them. Leeza Gibbons:	There are a whole bunch of them, which you've helped us realize. Yes. Thank you very much. There are a bunch of them. Dr. Daniel Amen:	... because I want to live until I'm 85, especially the closer I get to it. Leeza Gibbons:	Yes. I mean to look at it ... If you're watching this and you think about the people you know in your life, or maybe yourself, like look to your left, look to your right, you know, you're either going to need a caregiver or be a caregiver. And being in denial, which our society tends to want to just go into this hole, doesn't help anything. Dr. Daniel Amen:	Yes. Now we'll just get distracted by our phone and what latest tweet. Dr. Daniel Amen:	That's what happens. All right, so the one thing I discovered, that if you want to keep your brain healthy or rescue it if you're headed to the dark place, you have to prevent or treat the 11 major risk factors that steal your mind. Leeza Gibbons:	I'm hoping people understood what you said, 11 risk factors. One of them is genetics. Dr. Daniel Amen:	One of them is genetics. Leeza Gibbons:	There are 10 others. Dr. Daniel Amen:	And if you are not paying attention, one of them will get you when it didn't have to. Dr. Daniel Amen:	So we came up with a pneumonic that we like called bright minds, and the B in bright minds is blood flow. Low blood flow is the number one brain imaging predictor of Alzheimer's disease. Leeza Gibbons:	And how many brains have you scanned now? Leeza Gibbons:	So you kind of have an indication of what this is like, what this means, low blood flow. For somebody like me, and you've looked at my brain, you know that that's an issue that was in my brain. That means to rescue it, I need to do more exercise. Let's talk about all those things, 'cause we said there's lots of things you can do. Let's talk about things you can do for your blood flow. Dr. Daniel Amen:	So know if you have the blood flow risk. So, yes, you can get a scan. SPECT is a blood flow study. But also if you have things like hypertension or any form of heart disease, heart attack, heart arrhythmia, cerebral vascular disease like a stroke. For men, if they have erectile dysfunction, because if you have blood flow problems anywhere, it means they're everywhere. Dr. Daniel Amen:	And if you don't exercise. So the things to do, exercise is the obvious one because it increases blood flow. So you want to keep your cardiovascular system healthy, because your brain is 2% of your body's weight, but it uses 20% of the blood flow and oxygen in your body, so it's the most expensive real estate in your body. But there are other things, too, like ginkgo. So our supplements, like Brain and Memory Power Boost, ginkgo and vinpocetine both increase blood flow in the brain. Foods like beets and cayenne pepper and rosemary increase blood flow. Sugar decreases blood flow. Caffeine decreases blood flow. Nicotine decreases blood flow. I always say brain health is three things. Brain envy, you got to care about it. Avoid things that hurt it and do things that help it. So for blood flow, it's exercising and eating foods that increase blood flow. Leeza Gibbons:	That love you back, like you always say. Eat foods that you love that love you back. Leeza Gibbons:	If I may, with blood flow and all these other risk factors, these changes and the damage they may be doing to your brain start decades before you begin to notice a result. Leeza Gibbons:	It's ... big thing. Dr. Daniel Amen:	... with all the research is that Alzheimer's disease doesn't just show up 58 or at 78? I'd scanned a 59-year-old woman, and her brain was clearly Alzheimer's. The scan pattern is bilateral, means both sides, parietal lobe decreases, temporal lobe decreases. Odds are, she had negative changes in her brain in her 20s. Leeza Gibbons:	In her 20s. So if you're a young person thinking, "Well, I'll worry about this when I need to worry about this," this is the time to begin to put in those protective things, right? Leeza Gibbons:	The changes that you make, this is your insurance. Dr. Daniel Amen:	So the R is retirement and aging. When you stop learning, your brain starts dying. There's some other risk factors there of loneliness, having failed in school. So having learning problems, because then you don't love learning, and you don't continue it throughout your life. If you're in a job that does not require lifelong learning, you're at a higher risk. If you have high iron levels in your blood, because it prematurely ages you. So this is one of the few instances where leeches were actually a good thing, because donating blood actually helps to get rid of excess iron. So I have to do that, because I've always had high iron levels. Dr. Daniel Amen:	So I don't eat much red meat, because it has higher concentrations of iron. 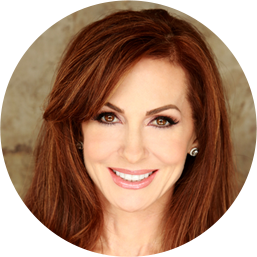 Leeza Gibbons:	But you do talk about protein throughout the day for your brain. Dr. Daniel Amen:	Protein and healthy fat, because it'll balance your blood sugar and you won't be overweight and you'll have good focus. The big strategy though for retirement and aging is lifelong learning. Leeza Gibbons:	He's chuckling off camera here. Dr. Daniel Amen:	... good for you. Dr. Daniel Amen:	There's exercise. Leeza Gibbons:	... positives. And there's the shame that some of us feel after we do it. That's the piece we have to take off [inaudible 00:09:26]. This is not a dance olympics. 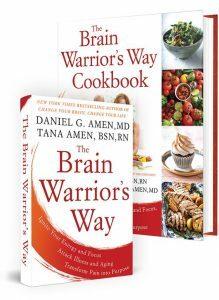 Dr. Daniel Amen:	... 'cause if we're not good at it, then that means our brain actually needs to do it more so we can develop a part of the brain we're not used to developing. Leeza Gibbons:	So we've got a bigger bell curve of achievement than people who are good at it. Dr. Daniel Amen:	... were low. So I think all of us should be taking omega-3 fatty acids and fish oil. Or if you're a vegetarian, using algae-based products to help you with that. If you have any form of gum disease, you have high inflammatory markers. And quite frankly, I never really cared about my teeth, 'cause I was busy. Then I read study after study, periodontal disease is associated with dementia. It's associated with heart disease. It's associated with depression. I'm like, "I'm not okay with that." Leeza Gibbons:	No. Especially when that's an easy fix. That's a habit. Dr. Daniel Amen:	It's a habit. So when I went to my dentist last year and he's like, "You just have the best gums," I felt like I was seven. I wanted to put the report card on my refrigerator. Dr. Daniel Amen:	I called Tana, and I'm like, "My teeth are great." And she's like, "Seriously, is that what makes you happy?" Dr. Daniel Amen:	Yes, that's what made me happy. Turmeric, or curcumins, we make something called Brain Curcumins, has an anti-inflammatory effect. And you have to kill the processed foods, 'cause processed foods are loaded with omega-6 fatty acids, corn, soy, all genetically modified, all raised with pesticides. But even if it wasn't, it's omega-6s are pro-inflammatory. They're called fall fats, because they put you toward the end of your life, where omega-3s are spring fats, because they help keep you young. And along with inflammation is getting your gut right, because when your gut's not right, you end with this thing called "leaky gut" which actually causes inflammation throughout your body. Leeza Gibbons:	But very treatable things that you're talking about. Dr. Daniel Amen:	All of this. None of this is hard, you just have to fall in love with your brain. And then G is genetics. What I have come to believe is, genes aren't a death sentence, they should be a wake-up call. Dr. Daniel Amen:	If you have grandma and your mom, it's like, okay, I need to pay attention to this, because as much as I love my four children, I never want to live with them. I never want them taking my keys from me. I don't want them deciding what I wear. No, I want to be independent. But that means, you know, I'm 64. I need to be thinking about it now, not when I'm 84 and headed to the dark place or further down the road to the dark place. But even if you have the e4 gene, even if you have two of the two e4 genes ... So that's what we think of as sort of the highest risk or one of highest risk, well, that means you have 10-fold increased risk. Well, it's 10-fold from 2.5%, so that means you have a 25% risk, which means you have a 75% chance something else is going to kill you. So it's not dire, but if it's me, I'm serious. Leeza Gibbons:	You want to mitigate that risk, because you can. Dr. Daniel Amen:	You want to mitigate it. And they found for people who have the e4 gene, exercise actually works better for them. Getting on an anti-inflammatory diet works better for them. Leeza Gibbons:	There's very motivating. 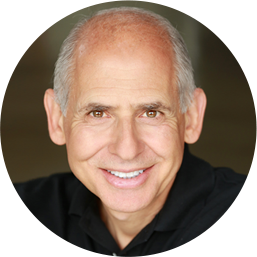 Dr. Daniel Amen:	... to do the right thing, having a nihilistic viewpoint. It's like, oh, well there's ... 'Cause when I first started scanning, I was so excited. I'd go to national meetings, and I had this one doctor from Washington University, and he goes, "Well, if you had that risk, why would you want to know?" Leeza Gibbons:	[inaudible 00:14:32] I hear it all the time. Dr. Daniel Amen:	I'm like, "Are you nuts?" If you knew a train was going to hit you, wouldn't you want to try to get out of the way?" Leeza Gibbons:	Get out of the way. Dr. Daniel Amen:	It's like, "Are you insane?" It's like, "Come on, let's be serious." Leeza Gibbons:	But you understand it, I understand it. We're fearful of the unknown. That's why I do name it and claim it and start an action plan. That fear can just devolve into something much more manageable. You can replace that with feeling how wonderfully proactive you are. Dr. Daniel Amen:	Well, I'd rather be in the fight, because I love my life and my wife and my mission and my kids and my grandkids. I mean, there's so many reasons to love, and I don't want to be a burden. Leeza Gibbons:	That's a big one. Dr. Daniel Amen:	When we come back, we're going to talk about more of the risk factors.